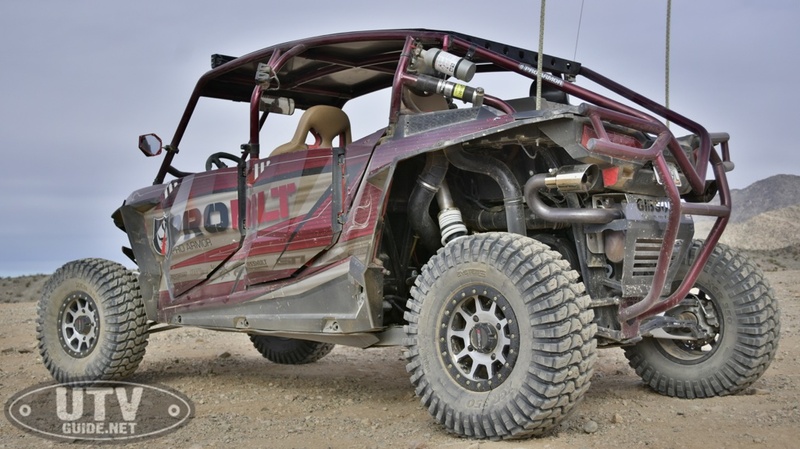 For years, tires and wheels have topped the list of aftermarket modifications in the ATV and UTV industries. As a wear item, tires need to be replaced at the end of their lifespan. 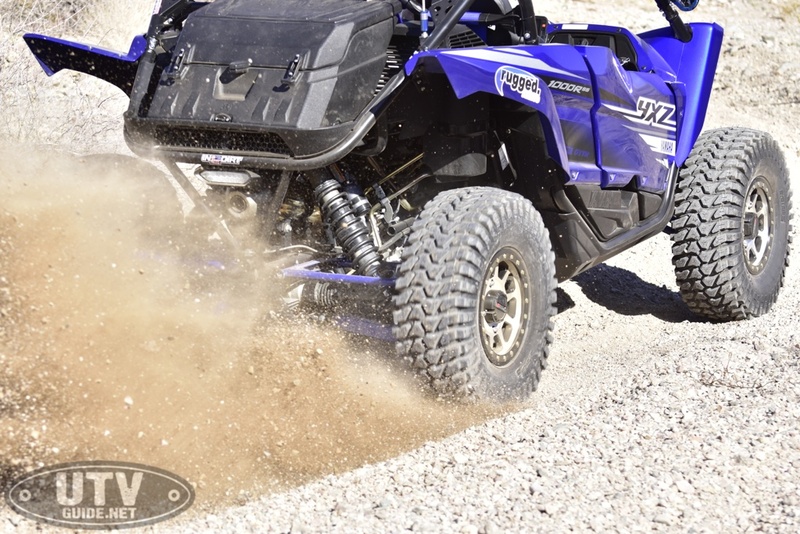 However, most UTV owners will opt for a tire and wheel package that better suits their terrain and riding style, replacing the stock pieces long before they are worn out. Here at UTV Guide, we take tire testing pretty seriously. There are a vast amount of options available to the consumer, which sometimes makes it hard to narrow down the right options for you. One of the newest tire companies out there is System 3, which is distributed exclusively by Dragonfire Racing and Tucker Powersports. Currently, they offer four different tire types and two different wheel options, with a catalog that is growing rapidly. For this test, we chose their most all-terrain oriented tire, the XCR350 X-Country radial. We wrapped it around their black/machined-finish SB-3 Beadlock wheel. We tested their 8 ply 30x10R14 tire, which weighs a claimed 39.7 lbs. For this test, we bolted them up to our brand-new 2019 Yamaha YXZ1000R SS, as well as a 2015 Polaris RZR XP4. 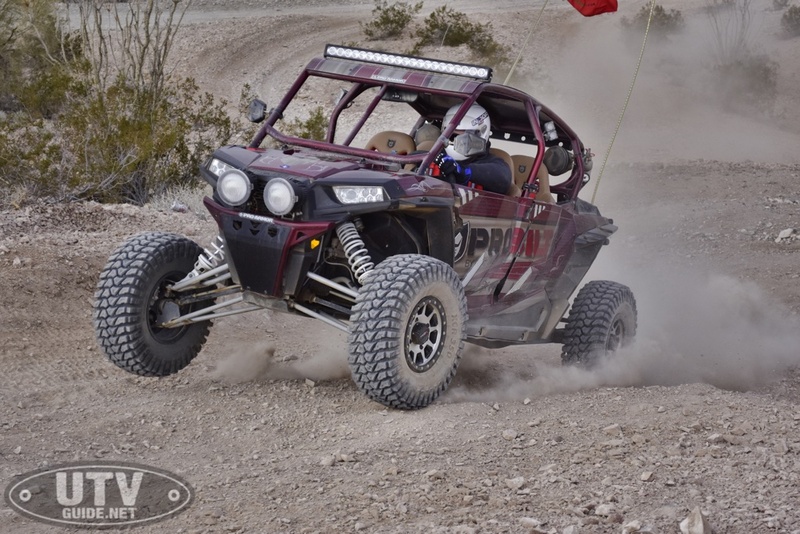 Testing was done in the desert terrain just outside of Lake Havasu, Arizona. This area contains a vast amount of rock, hardpack, thick sand, gravel, and silt bed conditions. We even took them to the dunes for a quick run through the sand. The System 3 tire and wheel kit certainly looked tough on our YXZ1000R. From the factory, the Yamaha comes with a staggered tire setup (narrower in the front, wider in the rear). This set of System 3 tires was a square set, meaning the same size tire on all four corners. We typically convert all of our UTVs to square setups, as it provides more predictable handling and the ability to rotate the tires to prolong their life. It also makes carrying a spare tire and wheel much easier. 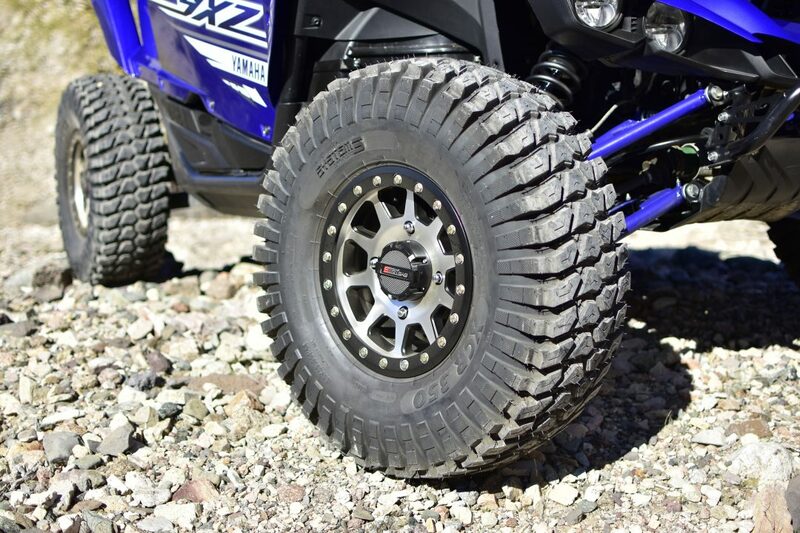 Pulling the new YXZ’s Bighorn 8-ply tires and beadlock wheels off of the stock car, we noticed that they are remarkably heavier than previous iterations of the Bighorn tire. Swapping to the System 3 setup, the weight difference was negligible. The tires have a much taller and wider profile than the stock 29 inch Bighorns, which gives the YXZ a very aggressive look. The stepped and siped lugs provide great bite without a ton of block squirm, giving them a surefooted feel in hard terrain. The XCR350 tire is a DOT-rated radial, so its manners on hardpack and pavement are excellent. There is no discernable increase in tire noise, but the steering response was immediately improved. This size tire is great for the new YXZ1000RSS, as its gearing reduction and new suspension settings really let it take advantage of the larger rubber. 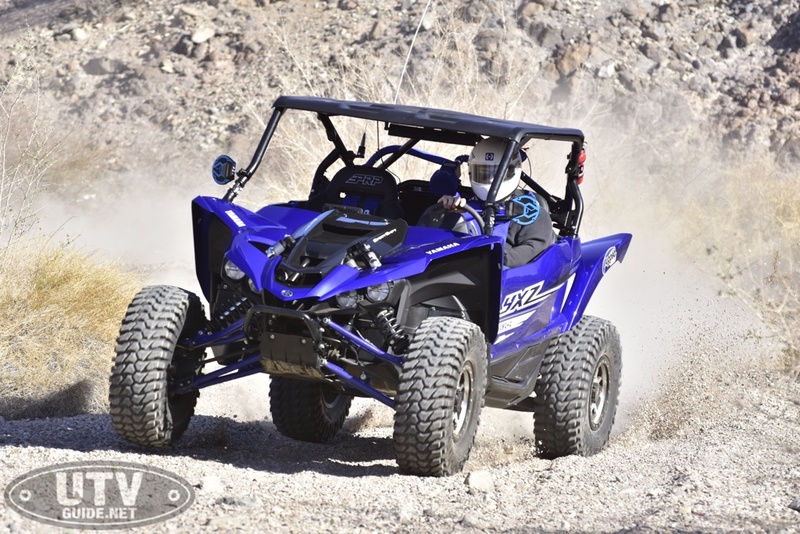 Steering fidelity remained razor-sharp, which is one of our favorite attributes of the YXZ. With this size tire, we would recommend upgrading the stock YXZ tie rods to larger, stronger aftermarket units, as there is a lot of leverage placed on the steering system with this much contact patch. We experienced no tire rub, even at full lock with the front end compressed. We played with air pressures, ranging from 18 PSI down to 10. Our sweet spot was right at 12-13 PSI, where we could get enough sidewall flex to provide a supple ride. The XCR350 tire is built for nasty terrain, so it’s no surprise that there is an ample amount of sidewall protection built into the carcass. The huge wrap-around shoulder lugs provide two things- grip and armor. We ran these tires through some thick, deep two-track sand wash that was littered with sharp rocks, and never once felt the need to avoid anything smaller than a football in the trail. The tires take the hits and keep coming back for more. We put a few hundred miles on these tires in just over a week, and never experienced any slow leaks, punctures, or tearing. In fact, the tread still looks nearly brand-new, which is a big plus in rocky conditions. Tires can, quite literally, make or break a car. While the stock Bighorn tires on the 2019 YXZ1000R SS are quite good, they lack a little in on-center steering feel and side bite. The XCR350 tires brought those attributes to the other end of the spectrum, especially in the sand wash. You can carry a ton of corner entry speed with this tire, turn in, and lay on the throttle. The incredible side bite provided by the long side lugs sticks the car in a rut like glue, pulling it through the corner like it’s on rails. The steering precision was so good, in fact, that we enjoyed running the car through the wash in 2 wheel drive. There is enough forward grip to keep the YXZ singing at the top of its register, and stabbing the brake on corner entry allowed the rear of the car to swing and set a line before getting back on the throttle. It made the car more fun to drive, and faster through the wash in our timed runs. We didn’t experience any of the dreaded carcass shake that you get with some larger aftermarket tires when hitting square-edged bumps. The XCR350s roll over obstacles smoothly and without drama. 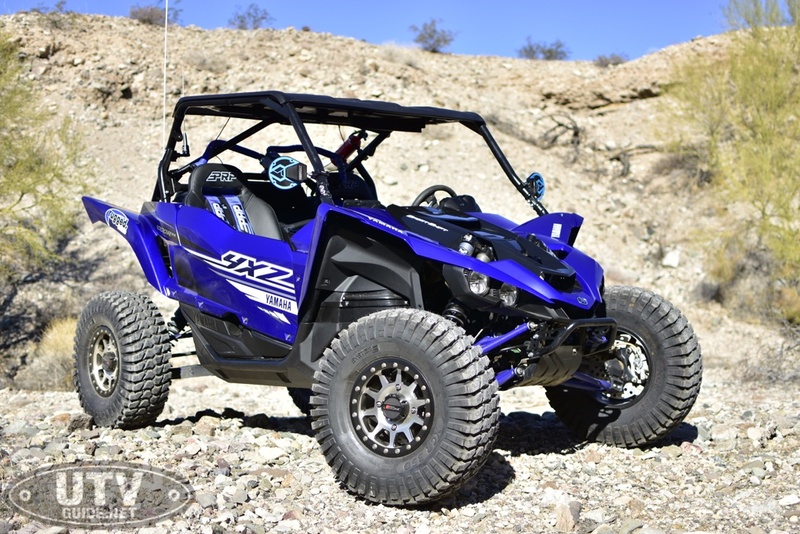 Hardpack traction is incredible at moderate speeds, making this YXZ an absolute weapon on desert trails. Predictability and stability are two very important factors in tire selection, and the System 3 setup has those in spades. System 3 bills the XCR350 as an all-terrain tire, which is typically what most users will want for their weekend outings. It certainly does the part, and while we haven’t had the chance to test them in mud, the carcass looks as if it will clean itself out fairly easily. On the RZR, the same feelings were echoed. Driving the XP4 in 2 wheel drive was much more predictable, as it didn’t send the rear tires into a flurry of wheelspin in soft corners. Forward traction and side bite were the most noted attributes by all of our testers. Even the passengers in the two cars remarked that the cars rode more smoothly and felt more composed with the XCR350 tires. 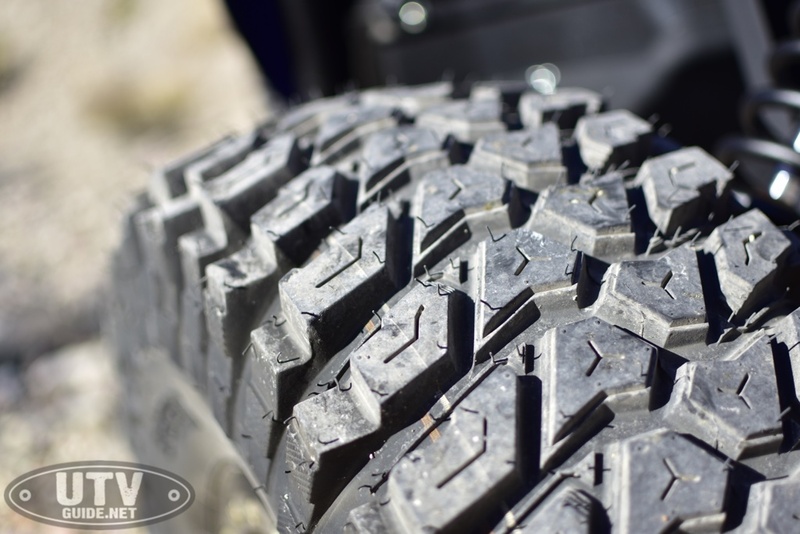 We swapped back to the stock Bighorns on the YXZ after a few days of testing, and we can definitively say that the XCR350 tires offered a substantial difference in traction. This setup has a lot going for it. The tires work well, ride smoothly, look great, and respond to terrain variation with poise. The SB-3 true beadlock wheel is absolutely gorgeous, regardless of which car they are bolted to. The SB-3 beadlock wheels are available in 18 different combinations of bolt pattern, offset, color, and size. The big plus for us is that the 2019 YXZ1000R SS now uses the same bolt pattern as the RZR, so the setup was completely interchangeable. 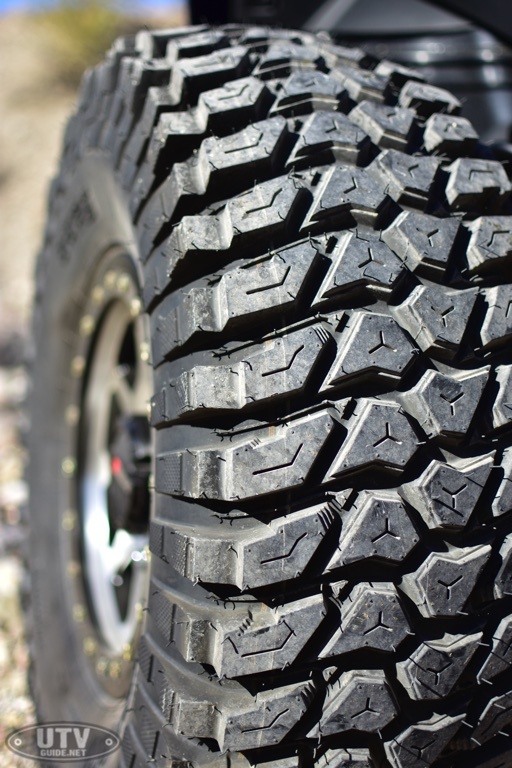 The XCR350 tires are available in four sizes, ranging from 28 to 36 inches. The wheels start at $165.99, and the tires range from $226.99-$283.99 each.